Last year saw the first ever Stage Management Day, a day for Stage Managers everywhere to share their work and ideas and for the public to find out more about how those of us who dabble in the dark “behind the scenes” arts contribute to productions of all types. We, the Stage Management Association UK, asked Stage Managers to make the day their own and, true to form, the Stage Managers of the world responded by showing just how creative they are. With many sharing their working day on social media, not only did last year’s hashtag #stagemgrs13 trend in London, but the number crunching shows that it was seen by up to 1.6 million people. From Australia waking up to California going to bed, Stage Management Day became a truly international event. 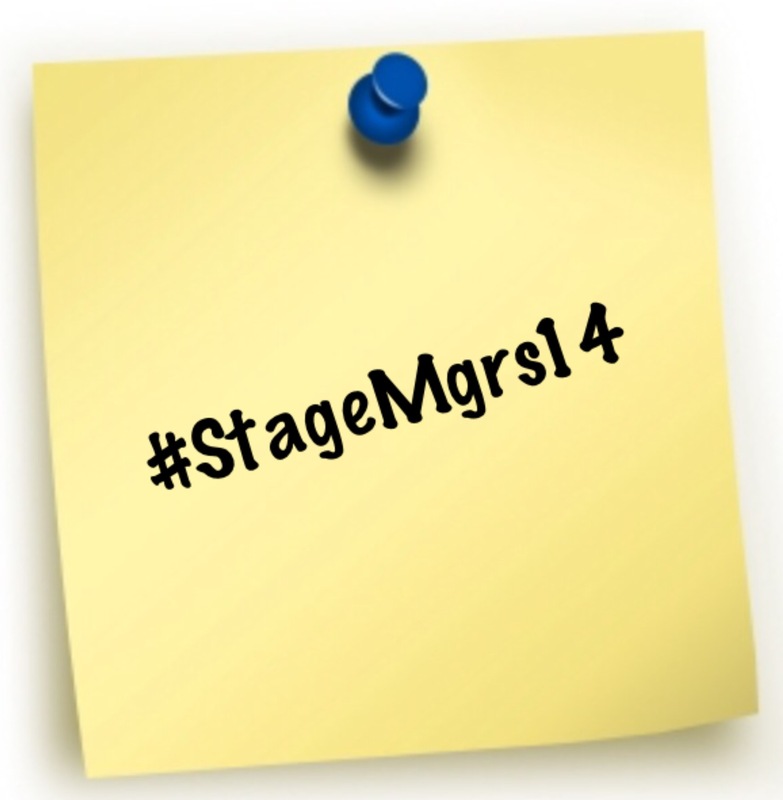 This year’s Stage Management Day is, once again, on October 10th and our new hashtag is #StageMgrs14. And again, we ask you to mark the day in the way that most interests you and to share on social media. Follow @bettswana celebrating #StageMgrs13 day with behind the scenes tweets at our first Stage & Orch for #Lucretia today! And there was cake. So much cake. Some of it raising funds for theatrical charities, such as The Theatrical Guild. @SMAssoc Every day is stage management day in the theatre. Wouldn't happen without you. Happy @SMAssoc day! Have a gaffer tape free day, prop off, cans down, lists laid to rest, colour your blacks & enjoy your undisturbed cuppa! Need more ideas? There are far more tweets, photos and blogs to look through, and more prompt desks than you can shake a cuelight at… here in our Storify. When you’ve finished looking back, start looking forward and help us pull off an even better International Stage Management Day. Have an amazing day. It’s all yours. This year, for one day, all over the UK, The Stage Management Association would like the spot light to pan off into the wings and pick up those backstage ninjas, stage managers. The day? 10th October, of course, because we think all stage managers deserve 10/10! Remember when Rock of Ages shared this YouTube video of the DSM calling a segment of the show? We loved it and we know other stage managers and theatre fans loved it, too. Could you get permission to do something similar? Could you film a video diary of some of your department’s work? A day in the life of…? How about a time lapse video of a fit up or a reset, or even of making a prop? We want to focus on stage managers in all types of theatre, whether large scale or fringe. It’s all interesting. Maybe you just want to film something a bit silly? That’s fine, too. Let’s face it, much of stage management centres around having a terrific sense of humour! Does your show have a Twitter feed? Would they allow a stage management #TwitterTakeover for the day? Or even the week? Sometimes the things which seem ordinary to us are intriguing for people who don’t work in theatre. Share those things. Who are the performers in your company who tweet? Would they do Twitter shout outs for the stage management team? We know they love and respect you… let’s make #StageMgrs13 the day when everyone puts it into words and photos. What fun events can you think up for that week? If you’re in the West End, there are so many neighbouring teams around that you could challenge one another to… a tug of war in between shows? Or something much more imaginative, and risk assessed to high heaven, than our idea. Get your thinking caps on! Maybe you can do something to raise a little money for charity? The Theatrical Guild and The Actors’ Benevolent Fund are the ones supporting stage managers in times of need. We want drama schools to get involved, too. What could you students do? Could you showcase your work? Or maybe challenge the actors to a mark out? A scene change contest, even? Just make sure they don’t win – we’ve got standards to live up to! How about a bit of a role reversal? Obviously we don’t want to encourage anarchy, but perhaps this is the one night when it would be nice for the stage management team, or indeed the whole backstage team, to join the cast for the curtain call? We understand some stage managers might actually pass out at the thought of this, so how about stage managers choose the music for warm up? Or your company manager give permission for one of the cast to call the half or read out the running times? Perhaps they can do the shout check with you or a bit of well supervised prop maintenance? Will you be in rehearsals in that week? Perhaps this is the day that your director will make your tea, and certainly we think that someone else should help out with the washing up that day. For those with matinees , maybe producers can pop down for a brew and a chat with the department they might not see that often. If they bring cake, and we have certainly suggested to them that they do, all the better! Does your theatre have an education department? We’d love to see them throwing the focus onto stage management that week. This is also the perfect week for the local paper to run a “Behind the Scenes…” feature. How about a post show Q and A with the stage management team one night? This would be really popular with the audience on a busy technical show. If you’re shy, get one of your cast to host it and all you have to do is answer the questions to which you, hopefully, know all the answers! In February The Stage Management Association held the first ever Stage Management Census and 767 of you responded. 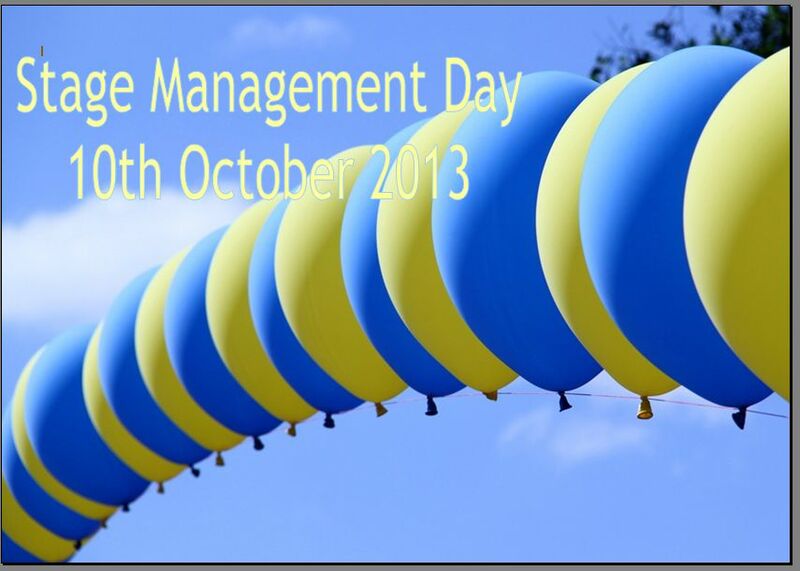 If 767 of you got involved with Stage Management Day that would make 10th October 2013 a fantastic celebration of all that we do. We’ll be using this blog to share the many ideas we’re sure stage managers are going to come up with, so we need you to get planning and to let us know what you get up to. – Upload videos to Youtube and let us know that they’re there. – If you have a blog, why not write something about your job or what stage management means to you? Come on, people. There are just under 8 weeks to go. We can put on large scale musicals in half that time!